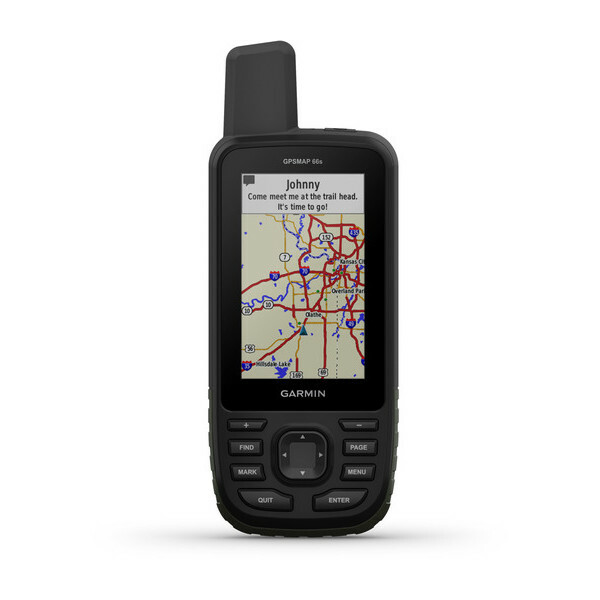 Garmin's GPSmap 66s is a rugged outdoor professional, significant upgrade and successful expansion of the GPSmap 64 Series! Improved hardware and features enable a very long battery life in StandbyTrac mode (up to a week) and even more accurate, faster satellite tracking (even on difficult terrain) thanks to GPS; GLONASS and GALILEO, the Quad Helix antenna and the automatic ABC sensor calibration. Also new are the extra large, sturdy 3 '' color display (240 x 400) and additional weather features. With pre-installed WW Basemap card, the huge 15.5 GB of internal memory can be additionally expanded via the microSD card slot. With Garmin Explore (Sync Data via Portal and App), Garmin GPSmap 66s also lets you plan tours and tracks offline. Satellite system: Highly sensitive GPS, GLONASS and GALILEO receiver for fast satellite reception, even in difficult terrain. Quad helix antenna for accurate location. 3 '' display (65k color transflective TFT), resolution 240 x 400, legible even in sunlight. Outdoor-optimized dual battery system for longer battery life (up to one week in StandbyTrac mode. 15.5 GB of internal memory with plenty of room for tracks and caches. Protected microSD card slot for additional maps, TracBack, waypoints and route navigation. Automatic calibration of the barometric altimeter and the electronic 3-axis compass. BirdsEye satellite download via Wi-Fi (real time). Wireless SW updates, apps, widgets and data fields via Connect IQ. Garmin Explore Portal and app for data synchronization and planning your own routes and routes. Wireless data transfer via ANT + to GPS devices or sensors (chest strap, cadence ...). Topo Maps, BlueChart g2, BirdsEye. Connected Features (Notifications, LiveTrack, GroupTrack, Activity Upload. Battery life up to 1 week (in StandbyTrack mode). Operation with 2 mignon batteries (not incl.). Shock and dust resistant as well as water resistant (according to IPX 73). Looks like availability is 5 to 8 weeks out. "Access to BirdsEye Satellite Imagery with direct-to-device downloads and no annual subscription". I assume "no annual subscription" means it is a "free" "lifetime" subscription. That is something new for Garmin handhelds. In addition to not having to pay the annual subscription, anyone who has gone through the agony of the long downloads of Birdseye imagery via Basecamp (including missed tiles requiring redownloads) and transferring these images from Basecamp to the device, will appreciate the potential advantage of this feature. If there are Birdseye problems, why would you assume they will go away when you download direct to the device? Do we know what kind of wifi it will have? Knowing Garmin, it's probably not the fast 802.11ac. If so, then you may have a much slower connection than you could get on a computer. I get 150 mbit/sec on my computers. My last Birdseye subscription expired many years ago. I'll agree, this is a step in the right direction, but this device just doesn't interest me. It says no annual subscription but somehow I think the $700/$800 price tag covers that price. Because of that price its a pass for me. My 600 Oregon still works fine and altough I would like the Connectivity features its not enough to cough up the price of a galaxy S9. I saw it somewhere being $800.00 or something.... but $450US is better but still steep for me. Compared to other Garmin handhelds in the current lineup, $400 to $450 is about what I would expect. If I recall, the GPSMap 64s was priced in that same $400 range when it was introduced 3 or 4 years ago. Because of the growing popularity if inexpensive smartphone apps, you could make the case that all Garmin dedicated GPS devices are overpriced. Garmin still improving a great product..kudos to them. Any hand held Garmins put cell phones to shame. Screen and all.. Readable in sunlight and long long battery life. And totally dependable for in the woods any where hiking.. keep at it Garmin..